A veteran is anyone who served full-time in the active military, naval or air services, including the Coast Guard – and who was discharged or released from the service in all conditions other than dishonorable. Veterans have a wide range of benefits available to them. They range from VA pension benefits (non-service connected) and VA compensation benefits – to vocational rehabilitation and grants for adapted vehicles, housing and equipment. If you are a disabled veteran, you’re invited to call my toll free Disability Information Answer Line at 1-888-878-9350 and I can outline the benefits that may be available to you. What are the VA’s non-service connected pension benefits? Veterans who served during wartime and have a low income and few assets may qualify for non-service connected pension benefits. The veteran’s disability does not have to be related to his military service. Are members of the National Guard entitled to VA benefits? Members of the National Guard activated for federal service during a period of war or domestic emergency may be eligible for certain VA benefits, such as VA health care or compensation for injuries or conditions connected to that service. Activation for other than federal service does not qualify guardsmen for all VA benefits. Claims for VA benefits based on federal service filed by guardsmen should include a copy of the military orders, presidential proclamation or executive order that clearly demonstrates the federal nature of the service. Does the VA grant allowances for dependents? Veterans whose service-connected disabilities are rated at 30 percent or more are entitled to additional allowances for dependents. The additional amount is determined according to the number of dependents and the degree of disability. What benefits are available for a veteran who needs help or is housebound? A veteran who is determined by VA to be in need of the regular aid and attendance of another person, or a veteran who is permanently housebound, may be entitled to additional disability compensation or pension benefits. A disabled veteran evaluated 30 percent or more also is entitled to receive a special allowance for a spouse who is in need of the aid and attendance of another person. How much are the monthly VA compensation benefits? How does a veteran or dependent apply for VA benefits? The form is called VA Form 21-526, Veterans Application for Compensation or Pension. You can get an application form online at the VA website www.vba.va.gov/bln/21/. Or you can call the VA Regional Office at 1-800-827-1000. If you’d like help applying for benefits (and the process is difficult! ), I’ll be happy to help you. Just call me toll free at 1-888-878-9350. As a veteran, do I have to testify in support of my claim? No, you cannot be required to testify; however, you have the right to request a hearing before the Regional Office or the Board, if you desire. No testimony is permitted before the Court. 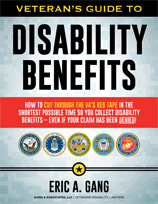 As a veteran, can I receive disability benefits and continue to work? Yes. You can work regardless of the VA’s assigned disability level, even if you are rated as 100% disabled. However, if you receive VA benefits due to individual unemployability or if you receive a VA pension, you cannot work. May I receive Social Security Disability and VA disability compensation benefits at the same time? Yes, you can receive both Social Security Disability and VA disability compensation benefits simultaneously. If you receive a VA disability pension, the VA usually will reduce your pension amount by the amount of your Social Security Disability benefits because the VA pension is based upon need. Are benefits continued if a beneficiary is incarcerated? VA benefits are affected if a beneficiary is convicted of a felony and imprisoned for more than 60 days. Disability or Death Pension paid to an incarcerated beneficiary must be discontinued. Disability compensation paid to an incarcerated veteran rated 20 percent or more disabled is limited to the 10 percent rate. For a surviving spouse, child or dependent parent receiving Dependency and Indemnity Compensation, or a veteran whose disability rating is 10 percent, the payment is reduced to half of the rate payable to a veteran evaluated as 10 percent disabled. Failure to notify VA of a veteran’s incarceration can result in overpayment of benefits and the subsequent loss of all VA financial benefits until the overpayment is repaid. Persons convicted of a federal or state capital crime cannot receive VA burial benefits. 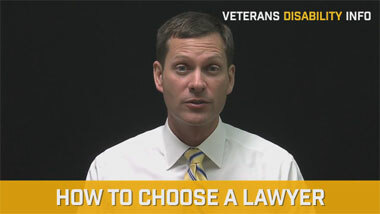 Is disability compensation affected if the veteran is a fugitive? VA disability compensation and pension benefits may not be paid to any veteran named on an outstanding felony warrant, or their dependents, until the veteran has surrendered to authorities or the warrant is cleared. How long will it take VA to consider my claim? The VA claims processing and appeal systems are overwhelmed with applications. You will face long delays at every level of the claims and appeals process. Unfortunately, the current backlog and high rate of errors continue to plague VA with no relief in sight. According to the Board of Veterans’ Appeals fiscal year report in 2006, it took an average of 489 days from the time a veteran filed his Form 9 (substantive appeal) for the regional office to forward the case to the Board. By fiscal year 2010 the average waiting period increased to 609 days. In the Board’s annual report for fiscal year 2010, it took an average of 212 days from when the Board receives a claim to when it issues a decision. And if the case is remanded (sent back) to the regional office, it took an average of another 493 days. If my claim for VA benefits is denied, should I appeal? In most cases, the answer is “yes”. While the law says the VA is supposed to give the veteran the benefit of the doubt and help the veteran with his claim, the fact is many claims are improperly denied. In recent years the Board of Veterans’ Appeals has remanded or sent back nearly 50 percent of the Regional Office decisions. For instance, in 2001 the Board sent back 48.8 percent of claims. In 2010, it sent back 42.4 percent of claims. If you hope to win your appeal, you must make sure you meet the VA’s appeal deadlines. In addition, you should carefully review the rating decisions and Statement of the Case to determine the reasons for the VA’s denial. These VA documents should explain why your claim was denied, which helps you understand what is necessary for your claim to succeed. In your initial appeal, make sure you provide any evidence that you did not provide with your initial claim because the appeal will reach a point at the Board level when you may not submit any additional evidence. The claims and appeal process is so difficult that many veterans become discouraged and simply give up on their claims. On some occasions, veterans choose to reopen their claims many years later and discover they have lost years of unpaid benefits. May I hire a lawyer to help me with my claim? How does a lawyer get paid? Why do they all say it won’t cost me anything to hire them? Not everyone can afford a lawyer. But it is important to have one. That’s why Congress passed the federal law called the Equal Access to Justice Act (EAJA). This law allows the government to pay your lawyer’s fees and expenses. What’s more, the money the government pays to your lawyer does not reduce or affect any money that you receive from the VA. This money is not part of your VA benefits. Best of all, the lawyer will not get paid unless he wins a remand or reversal at the court level. If the lawyer does not get a remand or reversal he will not get paid. This gives your lawyer a strong incentive to win a remand or reversal – because your lawyer gets paid only if he wins. What happens after I get a remand? Will I get more free help from my lawyer? Yes and no. Your lawyer may or may not be able to help you beyond getting a remand. Once you get a remand, your case goes back to the VA level. At this point, you want to add new evidence and plug holes in the case so that the Board will not deny your claim again. Since this is not at the Court level, your lawyer will not get paid under the Equal Access to Justice Act (EAJA). However, some lawyers will work with you at this level. They will help you get stronger medical evidence and present a stronger case. They will show you how to talk to the VA... in the best way possible, so you get your disability claim approved. Lawyers who do this usually ask for part of your back pay, usually 20% to 30%. For example, let’s say you were disabled several years ago, and you’ve been fighting this claim for many years. Let’s say the VA owes you $15,000 in back pay. If your lawyer helps you get your claim approved, he could ask for a fee of $3,000 (20%) or perhaps $4,500 (30%). 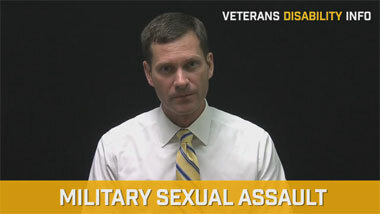 I represent veterans before the U.S. Department of Veterans Affairs (VA) and in Federal Court for Service Connected Disability and Rating Increases. As a result, I have an in-depth legal background with a wide range of experience. This includes extensive experience in building and developing evidence in complex cases. I will gladly review your case and give you an honest evaluation of whether I think it’s a winner or loser. Then I’ll suggest how we should proceed. If I think I can win your case, then I’ll offer to represent you before the VA or the Court of Appeals for Veterans Claims. The sooner you call me, the sooner I may be able to help you. So please don’t wait one moment longer. Call me today. Call me toll free at 1-888-878-9350 for a free, honest evaluation of your claim, at no cost or obligation.